Did you enjoy last weekend’s post? Well if you did, more awesomeness is awaiting you… so click that read more button now! Hey! Isn’t that Frozen? Well, it doesn’t look frozen anymore, but it looks like there’s been some more changes aside from that, doesn’t it? That is no more! The AI has been improved quite a lot, as I’m sure you’ll be able to tell. New Ai is capable of defending or attacking more properly. Also… there’s even more changes to CTP! Big changes indeed! 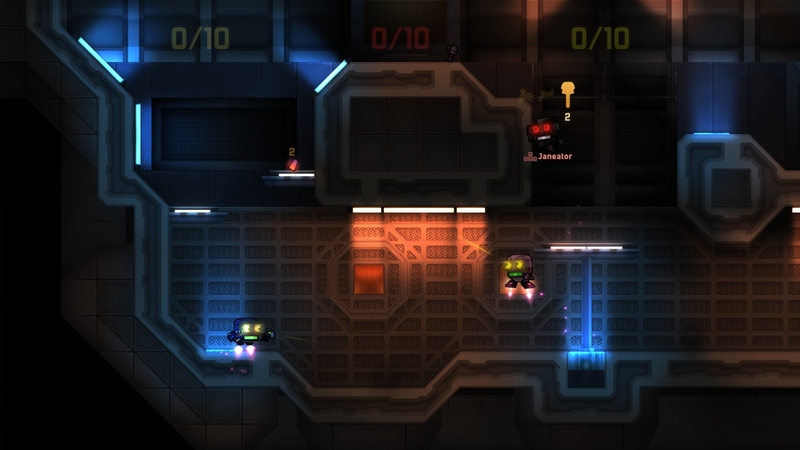 As you can see in that picture, players now drop random upgrades on death, like in dynamic deathmatch. All of this results in an awesome new way to play CTP maps! I’m sure you will all love it. What are characters? Well, these are what you pick on Team Strike, Challenge and (dynamic) Deathmatch maps. Actually, that definition is a bit outdated now. 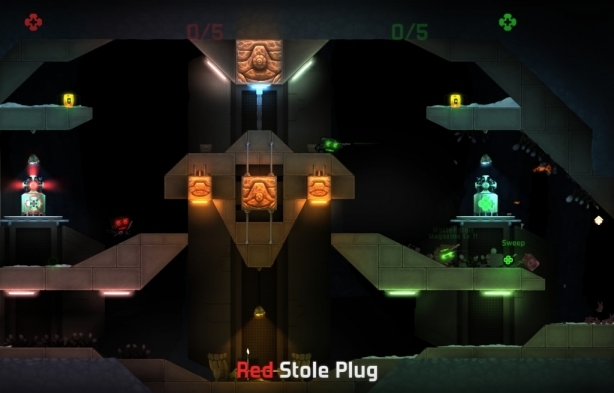 Characters have also been added to the reworked Capture the plug mode! And not just that, but there’s also a TON of new characters. And a lot of customization! Did you ever think there weren’t enough maps in the game’s Arcade? Then get ready for this… in this next update a number of dev-picked community maps are joining the game’s Arcade section! They will be ready for you to play right away just by updating/installing the game. 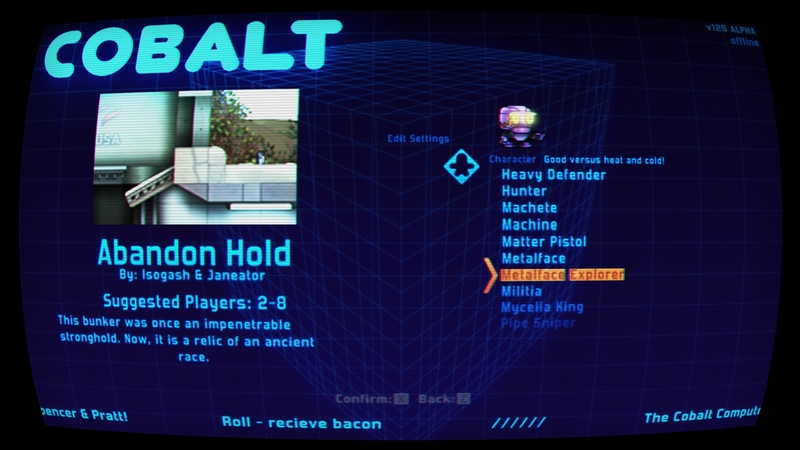 Also… if you haven’t yet, you should definitely try out Cobalt’s map editor! It allows you to create that epic map you always wanted to. if you need help or info, drop by the mapmaking section of the forum! If you want to try out the great stuff that some people in the community have already made, check out Cobalt Vault here. …or at least for now! But hey, this one is a really important one. No, I’m serious. Get ready to throw away your old skills (or part of them!) and learn how to play Cobalt again! Yes, you heard that right! Maybe you already saw Bopo’s tweet and have been trying to decipher its meaning? Wonder no more! Before, when you pressed Z, you would roll. Instead of hurting you, bullets would be deflected! Time it perfectly, and the bullets would fly straight towards your foes. And sometimes you even recieve bacon. The very top of your head, which will reflect bullets. The feet, which is now a weak spot! This adds a lot more depth to rolling and timing, instead of just spamming it. The rest of the body, which will deflect bullets normally. I have played a few matches using the new rolling system, and I like it a lot. Before, you’d have to keep shooting an enemy hoping that a bullet hit him between rolls, and hope that the reflected bullets would hopefully not kill you before that. Or if you were the one rolling, you just had to time your rolls to not be hit in between them. With the new system, all this rolling-spam action gets an update, but your skills need one as well. You’ll now have to think about rolling to the left or to the right, depending on which direction are you going, how far away the incoming bullets are… a whole new level of awesomeness! I truly cannot wait for v125 to be released to the public, and I’m sure you people can’t wait either. However, I believe it shouldn’t take too long now. There’s still a lot of bug fixing to do, but remember that if the update is taking long, it’s because it’s going to be awesome, and probably almost-bug-free. With all this said, let me know in the comments what you’d like to know next! At the moment there’s no more content for me to deliver in the form of a blogpost, but I’ll answer most questions that you guys write down there! Can’t wait for the update, keep ‘em comin’! Upgraded jet shoes? How would those be? Very nice to see a new post this soon. Very interesting changes. When will you think about porting Cobalt to other platforms? 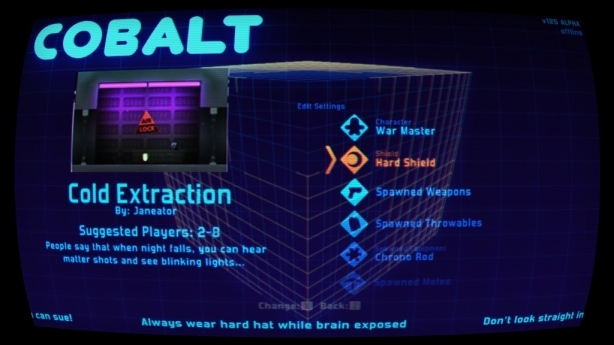 I’m big fan of Cobalt, but I can’t play because I’ve switched to Linux. According to http://playcobalt.com/, the game will probably be on Linux when Cobalt reaches Gold. Zyper, you can play Cobalt using Wine. I’ve heard it runs just fine! At this point I’m willing to say stop making the update better and just publish it! then add more stuff in the next one! Keep up the good work! Whereas if it were only one packet of chips then it would be better…..but coz it’s two……not so much. So that means this update is worth about one and a half packets of honey soy chicken chips…. Okay so something that is not pointless in saying, Can you give us some more info on the Adventure/Story mode next post please? Please with like, cherry’s and cream n’ stuff? 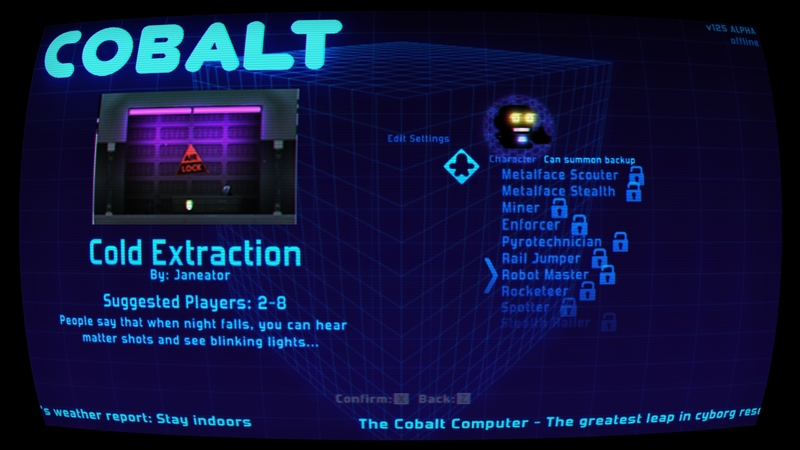 Just found this article, Cobalt isn’t dead ! And there is a truly awesome update coming soon ! Yipee Ki Yay ! Vauss: That is in the To-do list! AFAIK Online MP is a must for the Console port, which is already being developed, and after that, I’m sure it’ll also be available on PC! I think it’s pretty retarded that we’ve paid for alpha access but you have to be part of a ridiculous “special club” to get any of the alpha updates. Seriously, we paid for this. I don’t want to have to deal with a super-secret club and manage an attrocious spreadsheet just to play the latest Cobalt updates. It’s literally been, what, half a year since the last update? I mean come on. I’m genuinely ticked off that I, who has paid for alpha access, is not getting the most recent updates. Why do you have private tests for pre-releases of ALPHA builds? That’s what alpha is supposed to be in itself. I mean come on. I want to try the new updates without having to jump through hoops. I paid money, that should be the only hoop. We regulars will get the alpha updates. You can’t say that you aren’t getting what you paid for. I don’t really know how big a team Oxeye is but they most likely need those testers to squish out the bugs. Besides those patches are probably highly bugged and not too stable for normal “players”. The stable version will come out faster this way. Exactly. Releasing the update in its current stage would be a bigger pain for the normal players to deal with than not having it at all. I can agree that having to wait for so long is a huge pain, I can relate. But for example, every update basically broke your progress in Story mode, and you’d have to reset from the beginning. Most patches also introduces bugs that crash the game without you being able to progress at all, leaving you stuck at a certain part of the game and you being forced to wait for a new patch to be released. Would you want to play on that? Because I highly doubt it. Looking forward to this very much! Can’t wait to be able to play around with all these updates. Quick question… in the 124i update how do you unlock more charactors for deathmatch? Hm, I’m actually not sure about v124i… but in v125, you’ll be able to unlock them by gathering achievements and some other means I think. Hoping to see a focus on dev for Raspberry Pi one day. Mojang has done a great job porting to the Pi with Minecraft Pi. It would be awesome to be able to “sudo apt-get install cobalt” one day on the CLI for the Pi. Am I hoping and dreaming too much? I cannot wait! Any ETA on the next update? the community seems so excited! For what I know, it should be out before Minecon! Holy pie. Before Minecon? Minecon is only in……. *Checks calendar…*…….two months! TWO MONTHS!!! Really looking forward to this update. To be fair the Mac version was scheduled for Beta release. I hope it ends up getting done early too. When will colbalt be realesed for Xbox 360??? I really want to know! I’ve been waiting for so long!!! We are Oxeye Game Studio, a small independent Swedish game developer. HoodedRobin on Introducing Cobalt W.A.S.D. Irbis on Introducing Cobalt W.A.S.D. 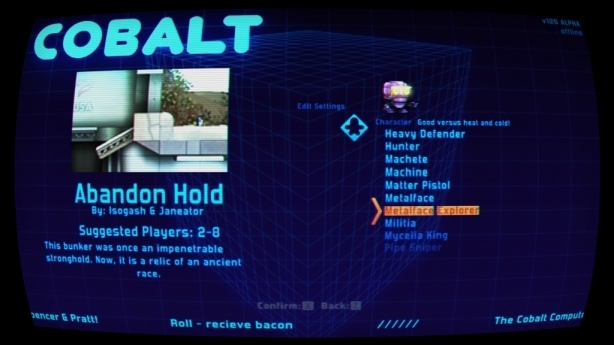 Thatoneguywiththewaytolongname on Introducing Cobalt W.A.S.D. jstewman on Introducing Cobalt W.A.S.D. Entries (RSS) , Comments (RSS) and YouTube Widget by Daiko.